Last season Swartz led Olathe North with 80 tackles, and was named First Team All-Sunflower League as a linebacker, and received Second Team honors as a Tight End. Swartz is a big kid who plays a physical brand of football perfectly suited for his positions. The thing that really separates Swartz on both sides of the ball is his closing speed on plays, whether it be running down a ballcarrier, or reaching a defender to block. On defense Swartz is tremendous in run support. He made quite a few tackles for loss last season and he is great at filling gaps. His size makes it difficult for fullbacks and offensive lineman alike to move him, and when you add in his quickness, it makes it even more difficult for offenses. 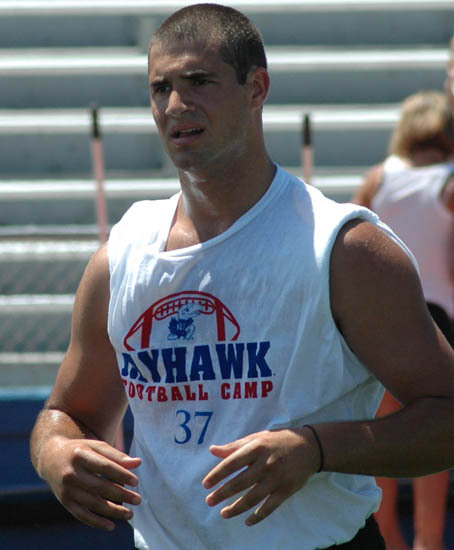 As a tight end, the majority of Swartz' efforts are spent blocking, although Olathe North did slip Swartz out from time to time to catch passes. He made quite a few downfield blocks for James Franklin and Tre Walker last season, and the same should be expected in 2010. Another big thing that Swartz brings to the table is enthusiasm and excitement--he doesn't going about his work quietly. Swartz seems to have an innate ability to make big plays defensively to fire up his teammates. Quite a few times last season it was a Swartz hit or tackle that really got the Olathe North defense going. we can talk about north's skill guys all we want. But what has made them great over the years has been their o-lines, and d-lines. I haven't heard much talk about what they have upfront this season. And Swartz is much more of a presence on the D side of the ball. Great point. Who is their to fill the roles of the outstanding Vincent and Venegas and the other linemen for the eagles. Did o North start all seniors up front last year? Olathe North's only returning starter on the offensive line is senior Josh Finley (6'1", 250). Carroll, Venegas, Vincent and Maggard all graduated. Olathe South returns 4 of 5 offensive line starters, but besides that no one has alot of returning offensive line experience. Eli- so does north have any promising new linemen that you know of? SM West is returning 5 guys who started at least a couple of games last year. Shupe, Askren, Rubeck, Rooks, and Hayward.